The New Hampshire – A truly stunning lodge! It’s all about features and luxury. The tall wall mounted radiator coupled with the feature fire make this living space a contemporary classic that won’t date in the years to come. Comfortable seating makes the most of your views or you can prop up some cushions on the deep windowsill and gaze out of your large windwos onto the outside world. Just step inside and start living those holiday dreams. 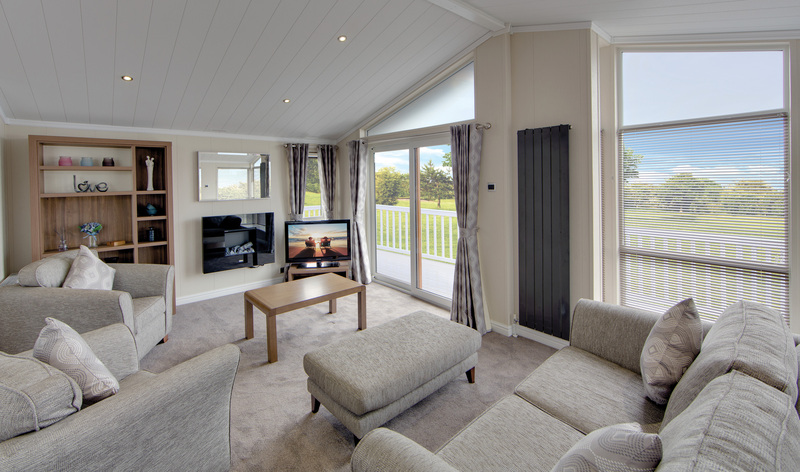 The lounge has double glazed sliding patio doors and a feature bay window with horizontal blinds. The two seater sofa and two armchairs (two bedroom models) give you plenty of room to put your feet up and relax. There is a wall mounted TV point (bracket not included). The kitchen has a breakfast bar with two modern bar stools so that you can sit and have your coffee and croissants of a morning. A double cavity oven and grill and integrated side-by-side fridge and freezer, integrated washer / dryer and microwave give plenty of scope to make mealtimes both delicious and easy for your. 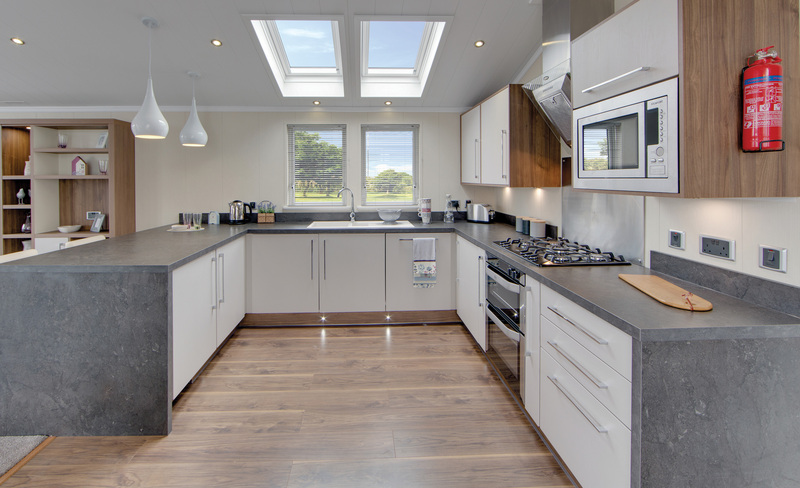 Two Velux roof windows with integral blinds flood the kitchen area with natural light as well as giving that all important sense of style and sophistication. Sit around your dining table with faux leather dining chairs with family and friends enjoying mealtimes together. A feature ceiling canopy adds to the natural light and viewpoint you can experience as you eat. You will feel right at home and positively serene in your Master bedroom which has a kingsize bed with lift-up storage system (selected models) and co-ordinated bedding – Cream bedding pack supplied, The twin wardrobes with feature lighting and overhead attic storage lockers provide plenty of space for lots of holiday clothing and a dressing table with mirror and stool means that you can get ready for those evenings out in peace and comfort. There is a wall-mounted TV point (Bracket not included.) 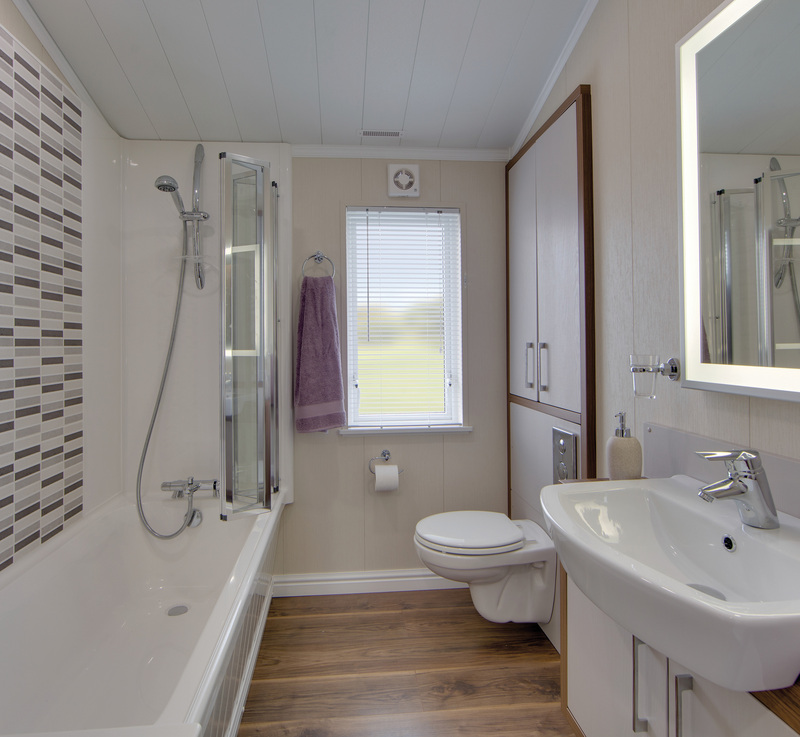 The en-suite is complete with Quad shower enclosure with thermostatic shower, wash basin mounted on vanity unit and “floating” dual flush WC. The Twin bedroom(s) have co-ordinated bedding – Cream bedding pack supplied. 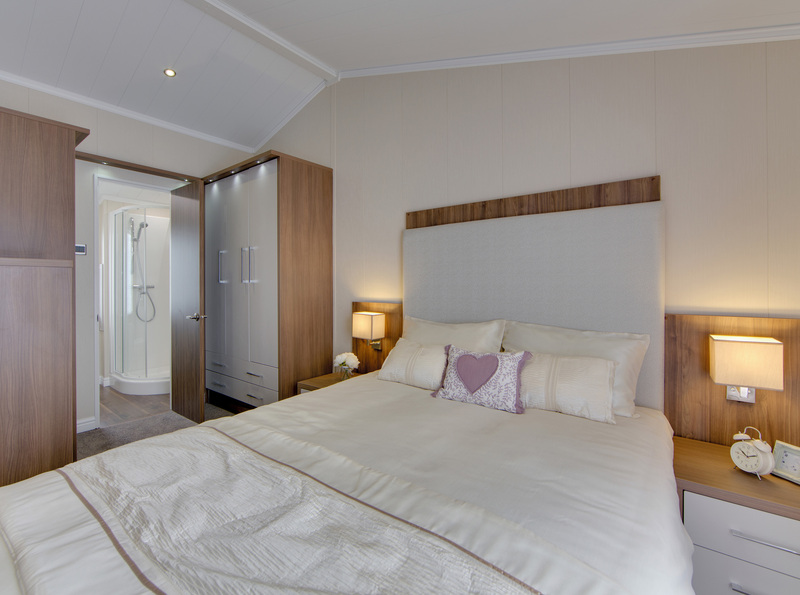 There are overhead attic storage lockers and a dressing table with concealed lift-up mirror and storage (42 x 20 models) . Also a wall-mounted TV point (bracket not included). The family shower room has a bath with overhead shower and screen, a wash basin mounted on a vanity unit and “floating” dual flush WC. “Deluxe Pack” includes kitchen carousel storage unit, two pull out racks either side of oven, lounge, footstool, voiles to bedrooms, integrated full size dishwasher (slimline for 42 x 16 models), underfloor heating to bathroom and en-suite. *Refer to Park Licence and assocaited planning conditons when selecting Leisure (EN 1647) or Residential BS 3632 (2005) versions of this product.